Do your socks smell of cheese? Yes. Sometimes so badly that I dream of camembert and wake up hungry. Do you hand wash your socks and unders (and are they wool) and how long does it take them to dry? My socks are wool, and get handwashed every three days or so (liberal estimate). My underwear consists of padded cycling shorts which I try to wash every day (often by taking them into the shower with me and using the lathered up pad as a sponge). In warmer weather stuff gets bungeed to my rack and is usually dry within a few hours. Now it’s colder I tend to wait till I’m somewhere with a radiator. Every few weeks some kind host will offer to put all my kit through their washing machine, and I’m usually so excited to have a whole pile of clean, dry, fresh-smelling clothes that I have to restrain myself from cuddling them. What do you normally make for breakfast, and do you make it before or after taking your tent down? Breakfast is usually half a loaf of bread with cheese, sausage or Nutella, whatever fruit I have to hand, and tea from the Thermos of water I’ve boiled the previous evening, to save me having to get my stove out again. And eating it is the very first thing I do, before I even get out of my sleeping bag. On freezing cold mornings like we’ve been having lately, I need every ounce of energy I can muster to get myself out of the tent. Do you always pack each item in the same place, or is your packing free-form? I’m a neat freak when it comes to packing, and everything has its place. I like to think this means I’ll never lose anything, but in reality it means that if I put something in the wrong place just once, then it’s lost forever. If you’re also a packing geek, and want to see how it all fits together, I have now itemized all my possessions on my Kit page, pannier by pannier. Keeping track of it all gives me a sense of control and comfort. Is there any item you’re now wishing you hadn’t brought with you, or anything you think would have been really useful but you left behind? I spring-cleaned and sorted through all my kit when I got to Goreme, with the intention of lumbering my sister with all the dead weight, but as it turned out, there wasn’t a great deal of stuff I didn’t regularly use (or wouldn’t be needing when the weather turns cold). 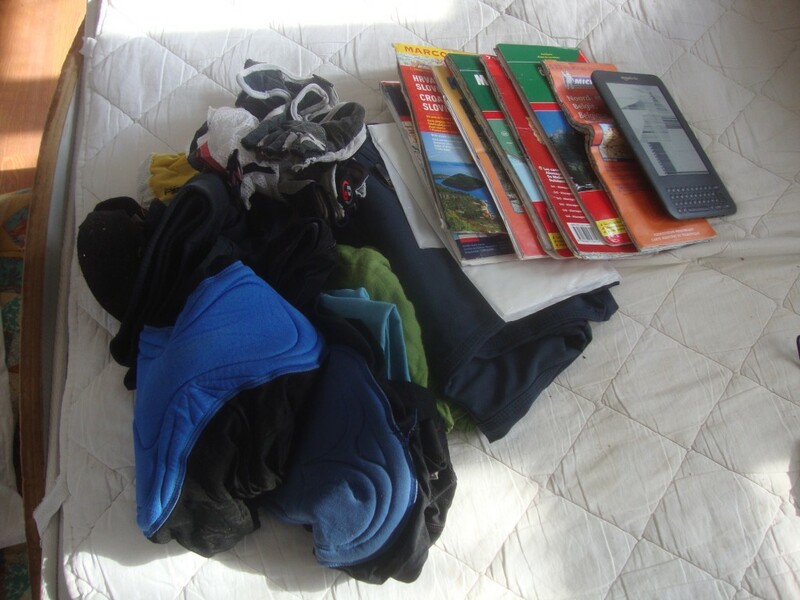 Most of it was maps, which were extremely useful until I rode off the edges of them, and then there were a few odds and ends of clothing – spare shorts and gloves – that I hadn’t really needed, but had stuck in anyway, because it seemed a shame to leave them behind. Likewise, there isn’t really anything I regret not bringing. What’s really been interesting is discovering the things I brought, not really expecting to use all that often, which have turned out to be essential pieces of kit. I think that’ll be a post in its own right one day. Thinking about your last few posts, are you actually finding that people become more welcoming to strangers as you travel further east, or is that just a cliche? Hmmm. I’d say that on average they are, but that doesn’t mean I haven’t had extremely warm welcomes from people I’ve met in countries further west. On my second night, a chap I didn’t know and had never even met (my sister’s boyfriend’s cousin) left me a key under a flowerpot so that I could stay in his house, even though he and his family weren’t in. And then there’s the Belgian couple who let me camp in their garden, and gave me dinner and a hot shower. And the gentlemen in Slovenia who stopped me on my way up a hill and insisted I drink a glass of wine with them. I could go on! The difference, since I got to Turkey, has been that the warm welcomes are much more numerous and regular. Several times a day now, someone will offer me food or tea, and the people I’ve stayed with have been generous to the point of embarrassment. I just have to ask, did you actually go past the Buzludzha monument? I need photographic proof. I didn’t, in the end. Was too ill, and wouldn’t have made it over the mountain, so just gazed longingly at it from Shipka and then turned round and wearily battled my way east to Shivachevo. So it and I have unfinished business. Have you slept under the stars yet? Not yet, no, though I always spend a while stargazing when I nip out to answer late-night calls of nature. I’d love to fall asleep under them, but I think I’ll save that until the weather warms up a bit. Only in as much as it might persuade me of the necessity of legwarmers. Is this journey fake, like the moon landings? Yes. I’m really working as a management consultant and writing this blog from my office in Canary Wharf. Don’t tell anyone. Can you not afford a car? Not any more. My bike was too expensive. Do you miss Noel Edmonds? I never aim for him. Do you still want back that £20 you lent me? Yes please. Did we ever discuss interest rates?